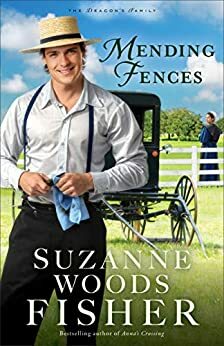 Mending Fences took me on a emotional ride and I mean that quite literally. One moment it seemed I was heartbroken and crying and the next minute I was laughing along with Izzy. I loved the descriptions of the countryside, imagining myself there and hearing the clip clop of the carriages going down the road. So many memorable characters! Amos and Fern stood out with their hospitality and love, the pastor stood out with his tough love and his generosity, and Luke and Izzy stood out learning how to deal with their past and trust people again. Each had to lean on God to help them deal with their pain. A deep hidden pain that manages to surface again for each one of them. There never was a dull moment with this book and I wanted to savor every moment. There were surprises of joy, love, forgiveness, and sometimes deep sadness that I couldn't imagine around every bend. This book ended so well but yet I want to know more. I can't wait for the next book. I just have to find out about everyone. I received this books for free. I was not required to write a positive review.